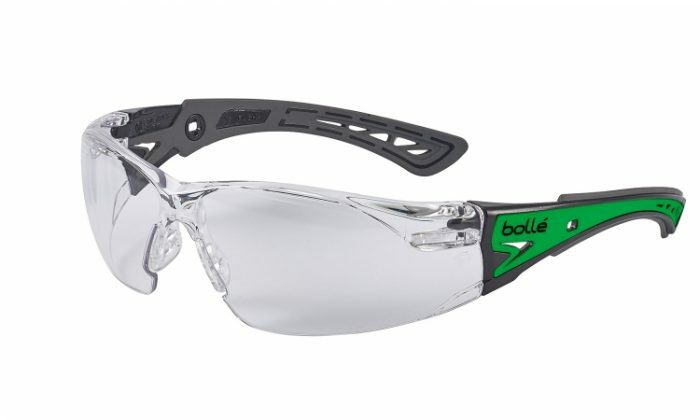 Bolle have released a new version of their Rush Plus safety glasses and this one glows in the dark. They only need 5 minutes of exposure to a light source to glow in the dark. They were designed for night works or working in the dark. They still have the very comfortable and flexible frame and the Platinum coated lenses. Bolle Rush Plus safety glasses with the phosphorescence sides so that they glow in the dark. They only need 5 minutes under a light source to achieve the ‘glow’ in the dark. These safety glasses were designed for night work, and have extremely flexible temples. There is upper brow protection, moulded into the frame front. A non-slip adjustable nose bridge. Making these safety glasses extremely comfortable to wear. The lenses have the Platinum anti-scratch and anti-fog coating.